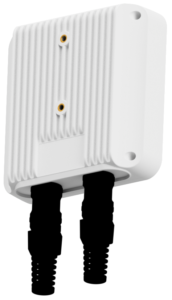 Sweratel Intelligent RTWIP mini-BS Node, Pard 25000 Embedded features flexible dual radio architecture for current and future 802.11ac-family wireless standards. The Intelligent Pard mini-BS operates on Sweratel RTWIP4.0 modularized software platform and allows Enterprises, Telcos infrastructure owners to achieve superior Cloud-managed Carrier-class WiFi netwokred service coverage for indoor/outdoor access networks. The Sweratel Pard 25000 mini-BS Node system is a compact rugged radio system built with modularized software framework architecture. The Intelligent Pard 25000 system delivers infrastructure that enables the first anywhere, anytime, IP-core wireless/mobile broadband network solution. Modularized framework architecture in RTWIP4.0 CORE technology gives the advantage of easy transition to any new or future radio technology. The Sweratel radio network consists of a number of BS Nodes, termed “Node BS’s”, controlled by a Cloud Managed Network Controller (MNC). A typical “macro-cell” location utilizes a number of Quad Radio Node BS radios in a 4 sets 3×3 (and/or 4×4) MIMO-sector configuration along with Dual Radio mini-BS Node, on the dualband 2.4/5GHz radio air interface. Node BS’s can also be deployed in micro cell and picocell architectures, according to Operators and ISPs requirements.